Frank Norton Jr. graduated from the Georgia Institute of Technology, but he spent most of his 60 years in and around Brenau University. The Gainesville native recalls playing games as a boy with the young women living on Sorority Circle, doing a fourth-grade book report with the help of a close friend to his mother and former university President Josiah Crudup, even taking his driver’s ed courses with the girls from Brenau Academy. He remembers the last classroom used by his grandmother, Dr. Isabel Verson – who was a professor of Spanish at the college for a decade – on the lower floor of the Jewell Building. He even got into some trouble from time to time on the historic campus, whether he was roaming unsupervised through buildings or, as a toddler, being yanked out of the fountain on the front lawn after unapproved swims. “I have an interesting perspective in that I’m 60 years old and probably 53 years of my life have been in and around Brenau,” says Norton. Norton is CEO and chairman of the Norton Agency in Gainesville, one of the most successful real estate and insurance enterprises in the region. He recently joined the Brenau Board of Trustees alongside his mother, Betty Verson Norton, WC ’52, who has been a member since 1985. Both the Verson and Norton families have a rich and beautiful history. The Versons’ roots are in Cuba, where Betty Norton and her parents were born. They came to the U.S. in the ’30s and became naturalized American citizens. But, due to economic constraints, Isabel Verson had to return to Cuba to help with the family business. In doing so, she forfeited her American citizenship, based on immigration laws at the time. Before long, however, the Supreme Court rescinded the law, and Isabel Verson became an American citizen for the second time. “We were able to have her come to the U.S., where she became employed at Brenau College as a professor of Spanish for the next 10 years,” Betty Norton says. Frank Norton says he very much identifies with his Cuban heritage, and his cousin, Martha Hodge, WC ’81, says it was always a singular part of her cousin. “I remember their family was so neat to me as a kid, because they knew Spanish words before anyone else,” says Hodge. Hodge says “Brenau was kind of our backyard.” The large family would attend plays in Pearce Auditorium or simply play on the lawn after school. Betty Norton says that all of the children in the extended, close-knit family regularly attended Brenau functions, both when they were young and after she joined the board. Even while he was away at Tech, Frank Norton remembers coming back on weekends to meet “some of the sorority girls.” He attended dances in the old gym and a formal or two in his hometown. After marrying and returning to Gainesville, he and his wife Nancy bought one of the old homes on Green Street, which is now the Norton Agency office. It was formerly the home of Brenau University presidents. Business leader and art lover Frank Norton Jr. , chairman and CEO of the family-owned real estate and insurance enterprise, standing before a painting of his parents, Frank and Betty Norton. One such charitable endeavor is his 15 years as assistant scout master for the Eagle Scout program in his old Boy Scout troop, Troop 16. Norton earned his Eagle Scout Award – the highest award a Boy Scout can earn – at just 13 years old. To date, he’s helped 130 scouts earn the same distinction. Hodge says Norton was always “very smart and creative.” He’s multidimensional, she says. He loves camping, gardening and being outdoors, but he’s also passionate about the arts. At a Rotary Club meeting in recent years, Norton took the podium in a regular meeting feature in which individual members answer a specific set of questions about themselves. When asked what his dream job is, he bypassed the kind of answer you would expect from a CEO of a successful company: “the one I have now.” Instead, Norton stated somewhat whimsically that he really would like to be an artist in the sort of bohemian lifestyle he enjoyed before he started up the career ladder in real estate. Indeed, he satisfies the whimsy – if that is what it is – by involvement in the Public Art Committee in the county and throughout the area’s arts community. He and his wife have given part of their personal art collection to Brenau on multiple occasions. And Norton still paints. These days the subjects of his artistic expression are often chickens – a fitting tribute to Gainesville’s reputation as the world’s poultry capital. 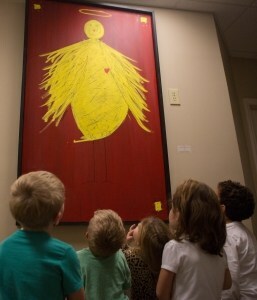 Norton’s folk art birds are often painted to resemble people, and he painted one chicken specifically for Brenau. She shines against a bright red background, and a small red heart is visible against her cheery, yellow feathers. A halo hangs above her head, and Norton says her name is Isabel, for his grandmother. She is displayed today in the Child Development Center, just next door to the Jewell Building where his grandmother once worked, and according to CDC Director Stephanie Clark, Isabel is a great favorite of the children. Betty Norton says that her son’s creativity, his selflessness and his ability to think outside the box distinguishes him from others. But above all, she says, is how hard he will work to better his community.